I am beyond passionate about writing. I truly believe that writing is the corner stone to all thinking. Through writing children gain higher level thinking, use their creative talents, strengthen their reading and speaking abilities, and so on! Writing is POWERFUL! I have one rule in my classroom (okay well maybe more than one) but anyways, we never ever write if it does not relate to a text we are reading. Why? 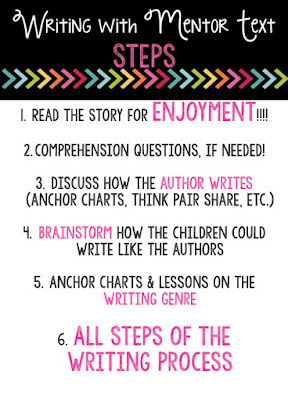 Because you need to connect reading and writing in those little minds. They need to know how easily reading and writing flows together. I like start writing workshop by JUST READING! We don’t fill out a story map or take a comprehension quiz. 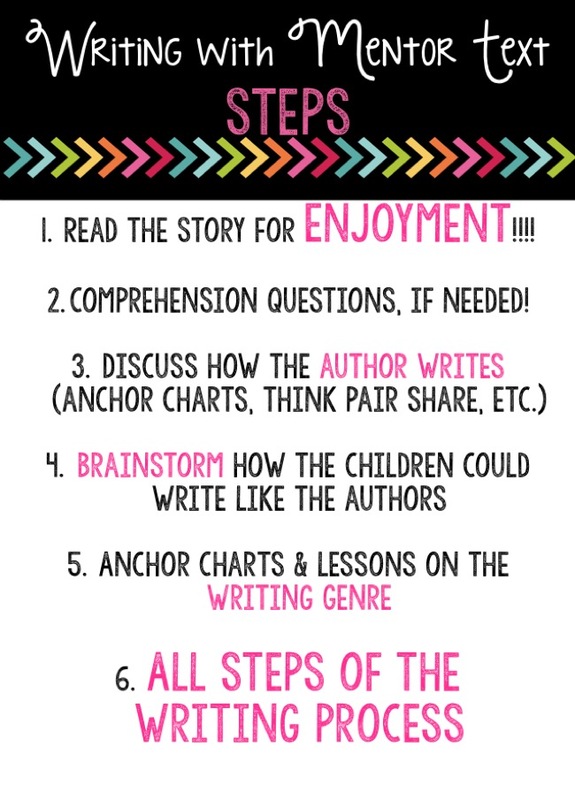 (every once in a while we do do some comprehension questions to get them thinking, who am I kidding) I show them how to enjoy the story and get into it! After reading the book, we discuss how we could write just like these authors. We brainstorm different ideas on how we could write books that are similar to these authors that we are reading. Then, we discuss that type of writing and we work our way through the writing process. Let me tell you these kiddos have some amazing writing when they can connect it to what they just read. They are creative, but also have something that they can compare and connect their writing too. I LOVE IT! 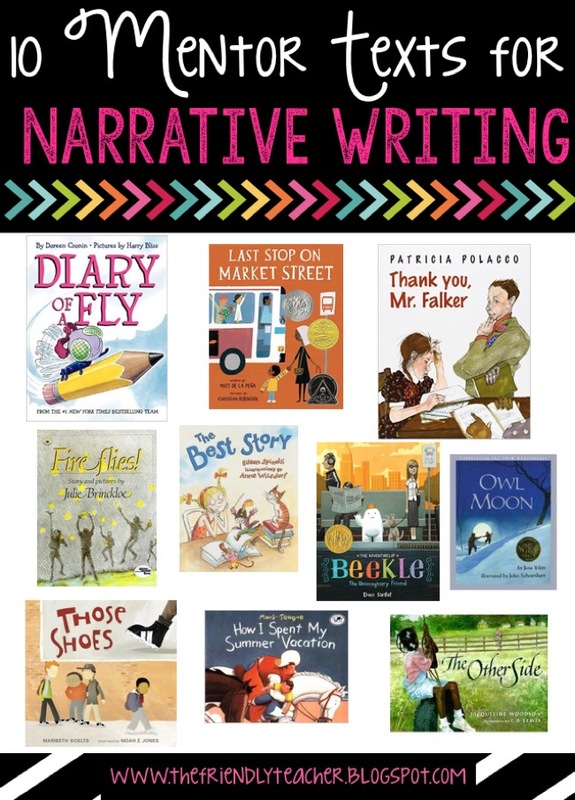 So, today I decided to provide you with the list of all my favorite mentor texts that relate to writing! Stay tuned to the end of a freebie!!! WOHOOOOO! 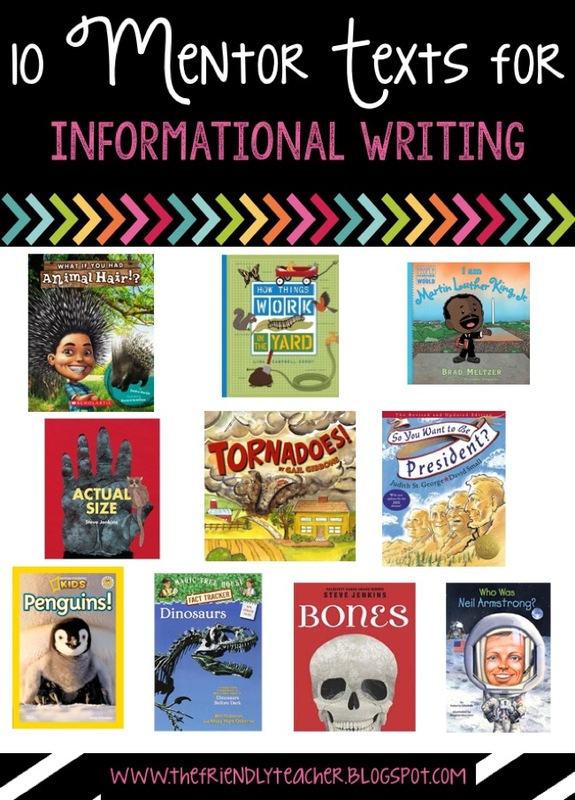 Informational writing is one of my favorite types! I love how children research and find information on their topic because it causes them to become so much more interested in their writing. There are some amazing informational books out there that lead to great writing pieces. 1. What if I had Animal Hair? by Sandra Markle -There are so many of these books that lead to such interesting conversations on the different types of body parts that animals have. My students LOVE researching all the different body parts. Check out this unit here if you need some inspiration. 2. How Things Work in the Yard by Lisa Campbell Ernest– My boys go CRAZY for these books! They love to know the backbone behind things. After they read some I have them write paragraphs teaching kids how specific things work. It is a how-to informational writing. 3. I Am Books– Amazing for an example of how a biography should be set up! 4. Actual Size by Steve Jenkins- This is a great comparative writing. I have my students read the book and then compare themselves to different animals. 5. Gail Gibbons Books (Tornadoes)– Gail has many amazing informational books that are made for children! It is a great way for children to visualize how to write informational texts. 6. So You Want to Be President? by David Small- Great to tie in informational writing with your government units! 7. National Discovery Kids (Penguins)– These are great for students to use in their research for their writing. 8. Magic Tree House Fact Trackers– My students go CRAZY for these! They all connect to one of the fiction Magic Tree House books so it is great for connecting fiction and non-fiction. It is also great to show children how you can write a whole chapter book on one informational topic. I like to read the book to the kids and have them choose one topic of the book to go and research more on. 9. Bones by Steve Jenkins- Steve knows how to do informational reading. It is interesting and engaging and my kids are INTO it! 10. Who Was Books-Amazing for Biography writing! Narrative Writing is so fun for the kids. Writing stories about themselves or others are their favorite! They just get to write and have fun. Sometimes with narrative writing their thoughts can be all over the place but if you have a mentor text they will have a great model of what it should look like! The following texts are great examples of writing in a story like fashion! Narrative writing has so many examples I could go on for days! 3. Thank you, Mr. Falker by Patricia Polacco– This book is a GREAT one and it teaches the children a new way to write a narrative! I love it because kids can write a story about themselves but not reveal it is about them until the end. 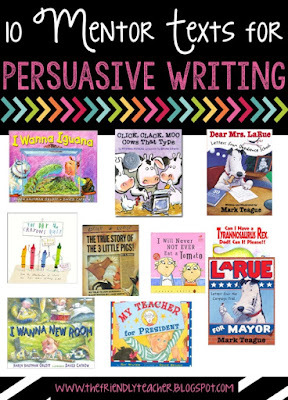 Now, please do not ever do persuasive writing without a mentor text! 🙂 I love love love persuasive writing because of the funny and interesting reasons that kids come up with for things! Mentor texts lead to the best persuasive writing ever! 2. Click, Clack, Moo Cows that Type by Doreen Cronin– This is great for persuasive letter writing. Check out the unit here! 3. 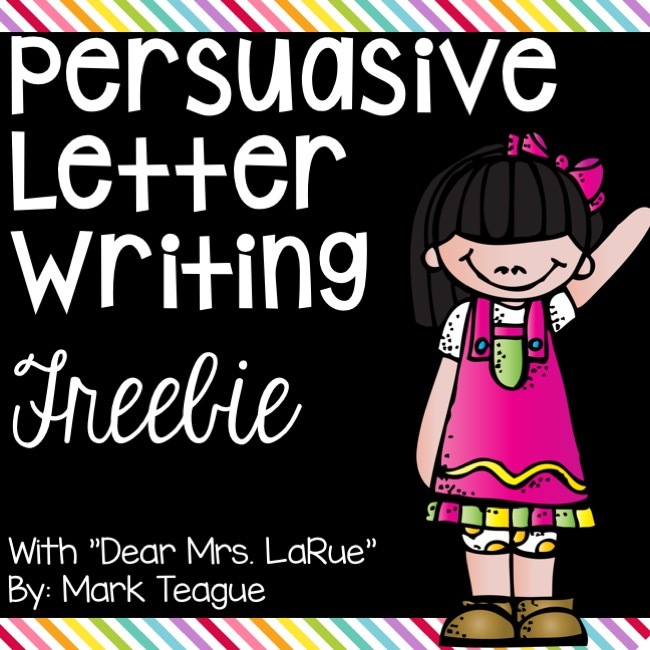 Dear Mrs. LaRue by Mark Teague-Another one for great letter writing & a there is a freebie to go with it at the bottom of this post! 4. The Day the Crayons Quit by Drew Daywalt-Hilairous letters will come out of this book! The students write in the eyes of a crayon and it is so much fun! Check out the unit here! 5. The True Story of the Three Little Pigs by Jon Scieszka- Have your students write trying to talk the wolf out of blowing their house down! The students will get a kick out of it! 6. I will Never Not Ever Eat a Tomato by Lauren Child- This is a healthy food lesson and a persuasive lesson! Get those two birds with one stone! 7. Can I Have a Tryannosuarius Rex Dad! Can I Please? by Lois G. Grambling– Dinosaur units are my favorite! My kids get so into them! Mix your dinosaur unit with this great persuasive book! 8. I Wanna New Room by Karen Kauffman- Writing letters to parents is always a funny way to mix curriculum with parent involvement! 9. My Teacher for President by Kay Winters- This is a fantastic way to mix government lessons with persuasive writing! You can have your kids write why you should be president or they could choose another person to be president. And you could see why your students love you so much. Who does not like that?!?! 10. LaRue for Mayor by Mark Teague- With this book you can have the kids write a persuasive speech on why someone should be in government! Hello, your are getting all kinds of content in there! Thank you for sticking in with me for so long! I hope that this will lead you to add more mentor texts with your writing. Why!? Because it is amazing, fun, fantastic, phenomenal, and any other huge adjective that you can put here! For putting up with my million book ideas, I’d love to give you a little freebie writing unit! Grab your FREEBIE for opinion writing with “Dear Mr. LaRue” by Mark Teague! I added this freebie to my TPT store today, just for you! 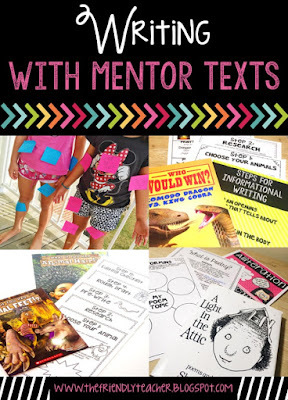 Check out my writing with mentor text bundle if you’d like to see more!